The Okanagan Symphony Youth Orchestra sparkled under the joint batons of Rosemary Thomson and Dennis Colpitts this weekend. The concert opened with Ralph Vaughan Williams’s Henry the Fifth: Overture for Brass Band. 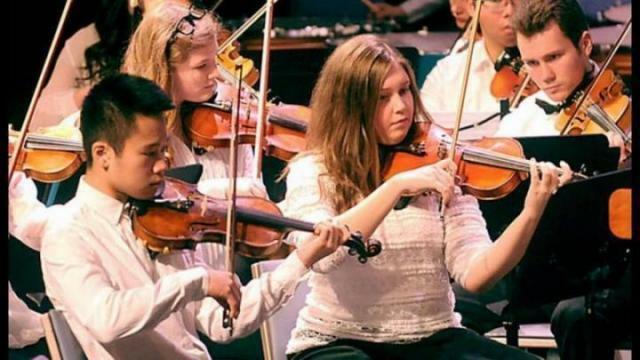 Rousing and robust, the Okanagan Symphony Youth Orchestra (OSYO) brought the music to life with great attention to the details of dynamics and expression. Complex rhythms were handled tidily and the ensemble of brass and percussion was tight and well-rehearsed. The next jewel was Nimrod from The Enigma Variations by Edward Elgar, conducted by Colpitts. The performance glowed with warmth and sensitivity and judging by the protracted hush at the end of the piece, the audience was deeply moved. The following jewel was a real sparkler. Sixteen year-old David Harker performed the first movement of Haydn’s Cello Concerto in C major, Hob VIIb. Harker’s performance was confident, accurate and competent and the orchestral accompaniment was light and buoyant. Following intermission, Thomson conducted Verdi’s Nabucco: Overture. The orchestra captured the quixotic nature of the work, easily sliding into the different characters the music portrayed. The piece demanded technical versatility and tight ensemble work and the OYSO handled it well. The concert’s crowning jewel was 16 year-old Wynn Nordlund’s premiere orchestral work, Une Legende Symphonique. A texturally thick piece that makes full use of the orchestra, the OYSO rose to the challenge and performed it admirably. Nordlund demonstrated an able grasp of orchestration, idiomatic writing for instruments, and innate sense of form. The final glowing jewel in this concert was A Salute to Richard Rodgers. After the complexities of the Nordlund piece, Ted Ricketts’s arrangement of Rodgers’s show music was light and these junior musicians relaxed into the easy rhythms and melodies. Hearing such music and seeing such devotion and discipline in our youth can give us all hope for a bright musical future. Anita Perry is a concert reviewer living in the Okanagan.